The newly formed clubs first team manager was appointed, Angus Seed brother of the clubs first target Jimmy a professional with Tottenham Hotspur. Amassing a 14 man squad for the clubs first season of Southern League football together with other expenditure amounted to some £300, season tickets cost 10 shillings. The clubs chosen colours of red and blue with white are still those used today. Grays Thurrock where the first Southern League opponents on August 27th 1927, a crowd of some 3,500 filled the "Rec" and went home happy as the "Shots" won 4-0, takings amounted to £154 and after expenses a profit of £75 was made. Progress during the clubs first season was excellent eventually finishing in 7th place, and averaging an attendance of 2,500. Top goal scorer was Albert "Sonny" Walters with 36 league goals in 23 league games (including six hat-tricks), a superb tally particularly as he only joined the club in December from Portsmouth. Sadly he was transferred to League side Luton Town in the close season. An excellent F.A Cup run was also achieved preliminary qualifying match victories were achieved against Guildford Amateurs, Addlestone, Guildford City, Thornycrofts Athletic and Kingstonians. The prize for making it to the first round proper was a home tie against Queens Park Rangers then of the Football League Third Division (South), over 7,500 packed the "Rec" however the game was abandoned due to fog with the visitors one second half goal to the good. The midweek replay saw the Shots take their first league scalp by two goals to one thanks to strikes from Hugh Collins and Jimmy Martin. 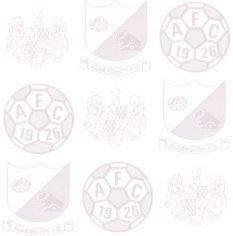 The second round draw took Aldershot to fellow Southern League (Eastern) side Peterborough and a 2-1 defeat. 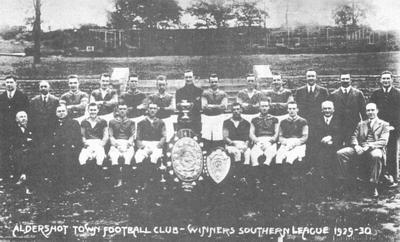 The 1928-9 season again saw the Shots make good progress in the Southern League (East) ending in 6th position, however the F.A Cup proved a disappointment losing a qualifying round tie at home to Guildford City 1-0. Another prolific scorer was found in "Sonny" Horton managing 27 league goals in one fewer appearances. Work was also started on the South Stand, still in use today. Although the board stated in the club programme and press that the gates were disappointing and would not sustain League football, surprisingly only 913 were present when the Shots visited eventual champions Kettering Town and came away with a 4-0 win. An application to join the Football League was made, however only five votes were gained. 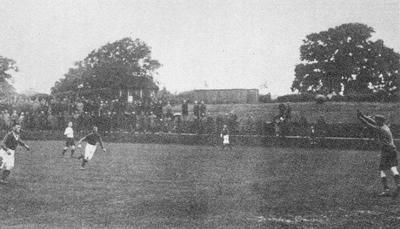 The 1929-0 season began with a home match against Norwich City Reserves and the opening of the South Stand, a good attendance of 3,522 witnessed a 2-1 victory . This was to be a sparkling campaign seeing the Shots crowned champions finishing three points ahead of Millwall Reserves, once again Sonny Horton was the danger man scoring 31 league goals in only 21 games before joining Millwall for £1,000 in January. Only five games were lost and 84 goals scored including four goals or more in 12 games, with Horton bagging four in a 7-1 rout of Northampton Town Reserves. The FA Cup also saw goals flying in with the Shots overcoming Kingstonians by 11-1 in appalling conditions of torrential rain and even snow!, not surprisingly only a little over 1,400 were there to see it. The first round proper took the Shots to Northampton Town and a narrow 1-0 loss ended interest in the competition for another year. Despite winning the title and the Horton transfer the club still made a loss of over £700.